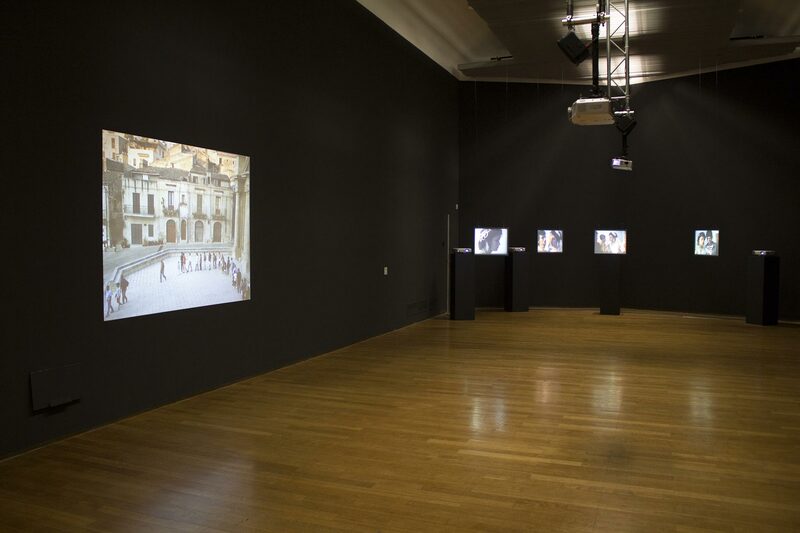 In this discussion about the Lives in Transit travelling exhibition, Albanian artist Adrian Paci will answer questions about his practice and works, and share his reflections on various periods in his life and creative work. 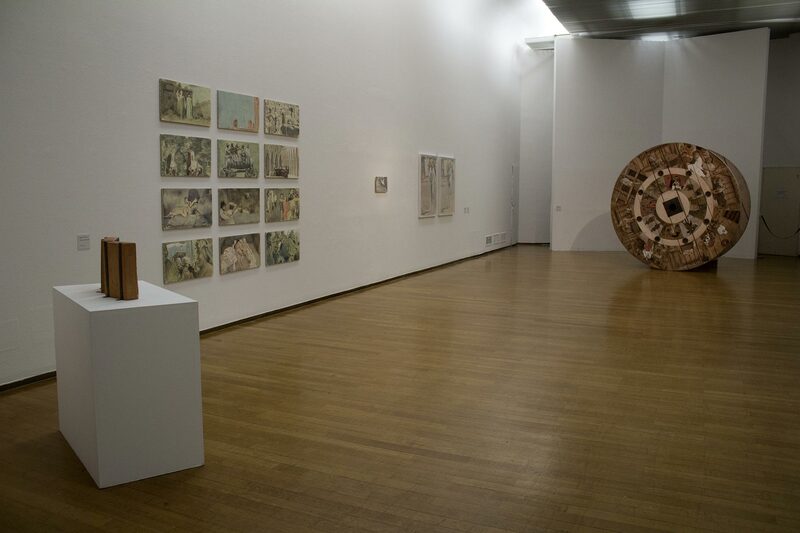 The exhibition has been shown at the Jeu de Paume in Paris, is currently on display at Milan’s Padiglione d’Arte Contemporanea (PAC) and in 2014 will be exhibited in Montreal, Gothenburg and Norway. In our conversation on Skype, we attempted to formulate and understand how images and complex situations are formally transformed and what sort of changes they undergo. The central theme of the interview, and in Paci’s creative work as well, is the phenomenon of migration, the tragedies of which are sadly continuing to occupy the front pages of newspapers. Paci talks of the crossroads in his life and art, and reveals his methods as well as his attitude to the potential of seemingly random stories which he is able to capture and illuminate from every angle. Barbara Fässler: Watching the development of your creative work, one notices the crystallization of a tendency emerging from autobiographical elements that, with the assistance of powerful metaphors, leads us from the theme of migration to a more universal principle. This tendency appears at formal level too – the images become more polished, clearer, more decisive, and the technical quality of the videos is constantly improving. How do you see the development of your creative work? Adrians Paci: Viewed in this way, it could seem that there has been a transition from vagueness to a more clear-cut situation. But I myself have a different vision of it. Obviously there are works in which there’s a differing degree of intimacy, and from a technical point of view, they are simpler than the more recent works. However, I wouldn’t like to say that the transition is only from purely autobiographical material to something more universal, or towards a better formal construction. If we take the first works, seen on the monitors at the entrance, none of the three videos – A Real Game, Piktori, or Believe Me I Am an Artist – derive from autobiographical intentions, notwithstanding that everybody sees me in them. The theme behind A Real Game reveals the interaction between games and fiction in the recounting of experiences. 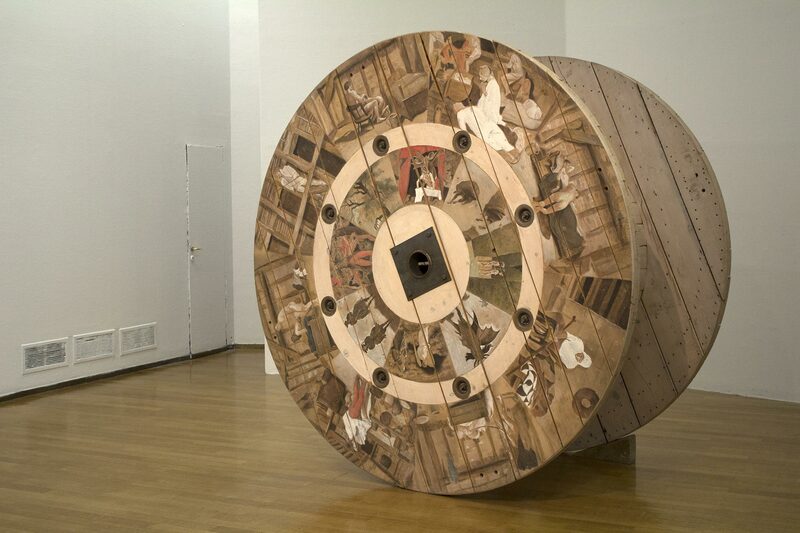 Piktori highlights the problem of how the language of art is recoded and reinterpreted in varying contexts. In Believe Me I Am an Artist, questions about “What is art?” and “What is an artist?” are posed in an unusual context. From the aspect of form, these works couldn’t have been any different. For example, in Albanian Stories or A Real Game, if I’d found myself in a studio with a RedCam, in front of my daughter sitting under the spotlights, I wouldn’t have been able to create this atmosphere of intimacy that is so indispensable. B.F.: In the first works one senses powerful feelings and sensuality, but equally a closeness to an aesthetic saturated with the reality of poverty-ridden Albania, and maybe it’s only natural that they emanate an extremely powerful melancholy conveyed by the images reminiscent of other places at other times. This sadness is particularly discernible in the exhibition at Milan’s PAC, in the Vajtoica video sequences where a veiled Signora is declaiming heart-wrenching laments about your fictitious death, and in The Last Gestures video installation, where the movements of stroking are slowed down and acquire a metaphysical heaviness. Meanwhile, in The Encounter video the empathetic principle is more emotionally distanced: the video has been filmed in a carefully prepared setting, and the performance has been staged according to a perfectly geometrical plan. The 700 people who have arrived to shake hands with you in the square in front of the Scicli Basilica in Sicily move forward in an almost perfect semi-circle, connecting the right and left corners of the image. In a flow of continuous movement they move to the centre of the square and turn around there, signifying your presence, shaking hands one after the other. What role is played in your art by emotions and passions? Have they been given other expressive possibilities in your newest, most recent works? Are there alternative ways of managing this in your most recent works? A.P. : The aspects of distance, and emotions and passions, are always present in my works. Even though this woman in the Vajtoica video sequences is lamenting my death in a very deep voice, it is still obvious that it’s all pretence, a construction. So all of the weight and the heaviness is lightened up by its fictiveness, and resolved with happy music playing at the end like a Happy Ending. The Last Gestures too, is a work charged with feeling, in fact we are indeed in a ritual, and in every ritual there is something of the theatrical. The people filmed in this work pose before the video camera. Even though there is a powerful emotional charge here, there is at the same time also a kind of estrangement which derives from the fictive character of the ritual. B.F.: There’s always also a meta-reflection about the narrative itself, about appearances, about how we see reality and how we talk about it. A.P. : Exactly, as in the work called The Encounter, where I wanted the framing to be from high up above. I wanted that entrance, this exit, that semi-circle, this scenography with these Sicilian palazzos – the stately buildings. with 700 people. For this reason, even if the video presents it all in a more distanced way, there is a real experience in this work, an undeniable emotional presence. In all respects I am in agreement with Deleuze, who says that a work of art operates through emotions and perception, and not through the intermediary of the idea, a philosophical concept. I try to involve the affective side in my work without, however, sinking into sentimentality. B.F.: You’ve come from one of Europe’s poorest countries, Albania, and arrived in Italy after the collapse of the Soviet system, with a scholarship from the Catholic Church because you belong to a Catholic minority, and you really began your journey from the very “lowest” point that there is: the humiliation as an immigrant of standing in line for a residential permit. After your first steps at experimental centers, such as the Isola Art Center, for example, today you are a recognized artist, exhibiting at the most significant and influential galleries. Even at just the aesthetic level, these two worlds couldn’t be more contrasting: between the scratched walls and frayed clothes (in the video) and the white walls and elegant clothes of the viewers (in the pagāt exhibition space). How do you personally experience this situation? Do you see a dialectic or contradiction there? A development as the natural progression of things? Or pragmatically, as a necessary precondition, so that you can maintain the opportunity to continue working? B.F.: Yes, that sort of thing has something of Hollywood about it. A.P. : Even as regards my first steps in art, starting with the Isola Art Center, things became more complicated: when I participated in the Isola Movement in Milan, I already had behind me a solo exhibition at a large Swedish museum, I’d taken part in the Venice Biennale and Manifesta. That is to say I’d already begun to exhibit, but notwithstanding, I very willingly participated in the Isola Art Center, just like now even after the PAC exhibition I can take part in a student exhibition at some little-known venue, because it seems interesting to me. It’s not as if I am desperately seeking success. I have no need to present my status quo as a contradiction – see, there’s a poor artist from Albania, who began working at experimental centres so that he could later get into the large institutions. My experience is not a contradiction, but development, progress. I wasn’t interested in remaining in marginal reality or, equally, breaking into the art world by any means. I’m interested in doing something and showing my work, because that’s how I can put it to the test, no? A.P. : And now, the PAC exhibition will be seen by tens of thousands of viewers. It will not only encounter success, but it will also be exposed to critique and reflections. That’s what really interests me. Obviously I am not a person who seeks a difficult life, no, I am searching for a comfortable life. That’s why when I bring in the harvest – in a financial sense, as well – then I can’t say that I don’t like it. There’d be a contradiction if I’d denied something of my past. When we speak of Albania as a poor country, we think in economic categories, but forget that it could be rich in experience, no? B.F.: Of course, and this can be sensed in your works. A.P. : I claim a right to this richness. Like the cultural baggage I gained in Albania – folk culture, but also the classical, and languages which I learnt, and artists who I got to know. This is all part of my past, even if now I live a different reality. I don’t see it as a contradiction, but as a passage, a transition. B.F.: The theme of migration weaves through your work like a red thread. In the Albanian Stories video, it’s your three year old daughter who tells stories which have been mixed up with memories about wars in Albania, and then the traumas which were created by forced relocation are worked through in another video – Temporary Holding Centre where the principle of migration becomes more abstract, almost becoming a caricature. The people with a previous history of migration, or the MmMs (1) as they are called in Germany, are climbing up some steps on the tarmac of the airport. It’s only when they all have climbed onto the metal structure that the television cameras turn away and we see that the plane to which we’d imagined these metal stairs going up isn’t there. In its place there is nothing, an abyss. This video is like a painful reminder about two very serious catastrophes involving inflatable rafts that happened very recently near Lampedusa, it reminds us that migration is often connected with enormous risks, victims and losses, and that those who have launched on this path simply don’t have any other alternative. One can only hope that these tragedies will change something and may give the conscience of Italy a shake, as well as Europe. The European Parliament is finally discussing practical support for these immigrants and the relevant countries, and the Senate in Rome is debating the Bossi-Fini Law (2) and whether to abolish the crime of “being in hidden immigration”. 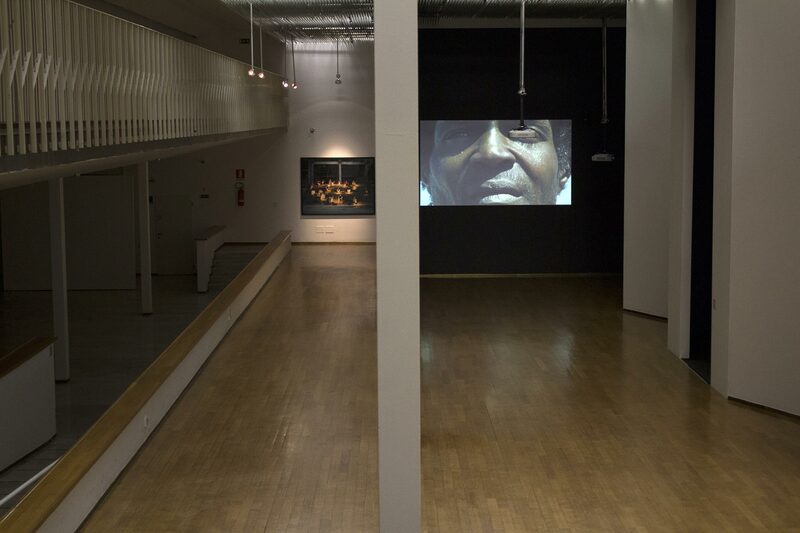 In your recent video works the theme of migration has taken on more aesthetic, one could say – symbolic, outlines. How do you view the reality of migration now? In respect to a world in which cities are becoming more and more culturally diverse, where their inhabitants speak in many languages, and have lived in diverse cultures? What are your thoughts and your position on migration? A.P. : Immigration is not only the theme of my work, it reflects my experience as well. It was the situation in which I found myself. As an artist I had to decide whether to include it in my creative work or to leave it out. I decided to include the theme, making use of its potential. I didn’t examine the problems of the theme as a scientist, but from the viewpoint of an artist trying to come to terms with his own experience, and also the experience of those people around him, at the same time attempting to talk about this in all of its complexity. An experience is never unambiguous, it is always tangled, intricate. That’s why I’ve tried to make it into a departure point for my reflections, for my work. In the Temporary Holding Centre video they talk about being in transit, in a kind of threshold zone. It’s a transit zone which paradoxically becomes a place where to stay. A.P. : Such a powerful event – in the end, what does it all mean?… With all of today’s opportunities for communication, you cannot deny people the possibility of traveling physically. However, physical displacement leads to contradictions, which enlightened politicians can only govern to some extent, but cannot eliminate. Multiculturalism, in a sense, is its consequence. In a world where people move from place to place, bringing with them their culture, language and way of life. I don’t agree with the idea that all of this enriches us and – full stop. We cannot reduce this to the level of United Colours of Benetton. Migration is a reality where diversity is managed, dialogue is used to resolve it, and it has to be dealt with, without fearing the conflicts associated with it. We mustn’t try to avoid it, or stamp down on it – then it could explode and become uncontrollable. B.F.: Your latest video work, The Column (2013), was created for this traveling exhibition specially, and transposes the reflections on migratory flows and work in progress to a universal and metaphorical level. 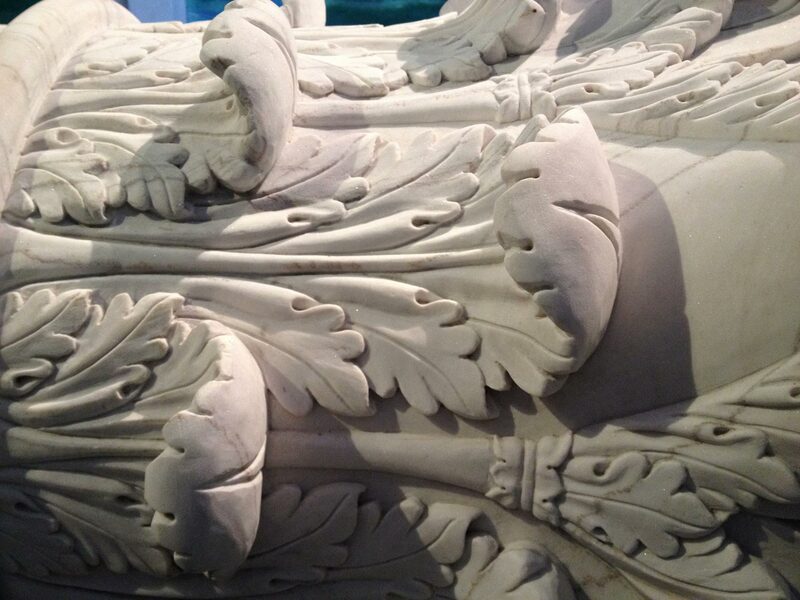 In the video, with its outstandingly clean and pure images and sound, we see how a marble block begins its journey of transformation from China to Europe on a factory ship, where five Chinese sculptors carve out a classical column with a Corinthian capital. Therefore, an example of antique European culture, which is a Chinese copy, arrives in Europe, and the fact that the time and space of its creation corresponds to the time and space of its transportation underlines the importance of the process of its transformation. The fact that the column is seen lying down makes us think again: are only half-finished columns still being made or those which are in ruins displayed lying down? And a column which is still in “operation” is always set up in a standing position and fulfills the functions of a support? Columns remind us a little of horses who never lie down, only when they die… How would you explain the point of this complex work? A.P. : Before the idea, in this work, there was a story. Someone told me that there were these factory ships on which they produce these marble sculptures. When I encounter such a story, what interests me is its visual potential. I found very powerful the idea of an antique model that travels from the east and returns to the west through this physical journey across the ocean of the Chinese sculptors on a ship. I was struck by the fact that, present simultaneously on the one hand, is the beauty of an artefact, a classical example, and on the other, the dynamics of our modern world with its political contradictions, with exploitation of labour and China as a very powerful player in the dynamics of today’s globalized world. You see, when there’s such rich potential in a story, it gets me going and I do something. So this work was born in order to investigate this potential mentioned, and it’s not going to be just a message and basta, a meaning and basta. It contains potentialities within it, ones which I saw in the story at the very beginning. B.F.: And the column lying down? A.F. : Look, yes, the column lying down gently emphasizes a state of peace, this readiness for one more journey, because it hasn’t yet found its place. You almost want to stroke it, it seems as if it’s asleep. To me it seems more powerful lying down than standing up. And in the course of making the work I discovered other connections. Someone told me about a column which Constantine carried from Rome to Istanbul or about Mussolini who also ordered the despatch of an antique column to Chicago to honor an Italian pilot. The idea of a traveling column didn’t just spring from my mind. There was already something in this story and these facts that I wouldn’t have been able to conceive, or predict. B.F.: Your creative works pass from water colors to painting in oils, from sculpture in synthetic resin to marble, from amateur video to HD with unbelievably complex technical solutions. All of your works are mutually linked by some thread that is never only purely formal or external, but often has to be looked for among your deepest concerns. What are your next moves? A.B. : (Laughs.) To say already what the next moves will be seems to assume as self-evident that there is some precise strategy underneath it all. But no, I hope that I’m able to look at what’s around me, carefully and naturally, and that something unexpected could happen here. I’d like to say – the next moves will continue the previous ones, and that, it seems to me, is already a lot. Look, obviously there is an internal dynamic in this work. From one job another is born. But there’s always a window open to the stories I live, to the images I find in my path, and to the people I meet. That is why all of this, to some extent, also determines my work. You can never foresee these moves in advance. There are situations that happen to you, which awaken something and become, it could be said, the starting point for a new adventure. (1) From the German Menschen mit Migrationshintergrund. Here and henceforth – translator’s notes. (2) It. Legge Bossi-Fini. The law was named after its signatories – ministers in the Berlusconi government, Gianfranco Fini and Umberto Bossi; more precisely – the Republic of Italy Law No. 189 of 30 July 2002, by which the Law on Immigration and the Legal Status of Aliens was changed. The Bossi-Fini Law, among other things, prescribes the immediate expulsion of illegal immigrants from the country. Amnesty International has expressed concerns about the consistency of this regulation with the UN Convention on the Status of Refugees (1951) and on the rights to asylum.